You already know the about the state of the venture capital industry in 2009: venture investing down (32%), exits down (14%; slowest exit year for VC backed companies since 1995), fundraising down (56%), IPO’s almost non-existent (8 venture backed IPOs in 2009). It’s a bleak picture for the industry overall, even if there’s a group of us that continue to believe this is a great market in which to be investing (and it clearly is). These stats got me thinking about the future of the venture industry and I thought I’d offer up some thoughts on where we might be headed. First, let me frame the conversation by stating that I agree with Fred Wilson’s assumption that somewhere around $15Bn is the right “steady state” investment pace for the venture industry as an asset class. At this investment level the return profile of the industry maps to a reasonable expectation of inputs and outputs (the money invested in start-ups as compared to the exit activity). By that measure, we actually still have a ways to go to reach that equilibrium in the venture markets. 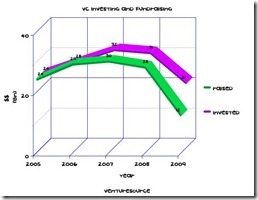 According to VentureSource, $21Bn was invested by the venture capital asset class in 2009, and this amount was the lowest investment total in the 10 years of data that I had access to. The system is still a little bit out of equilibrium, however, as this is a far greater total than the amount of capital raised by venture firms in 2009 ($12Bn). In fact looking back at the past five years $14Bn more has been invested by firms than has been raised. While presumably this will lead (eventually) to fewer dollars invested, the VC fundraising average for the past 5 years has been almost $25Bn, suggesting that we still have a ways to go to get to Fred’s $15Bn bogy. What’s even more interesting to me is to consider the nature of this fundraising and the ramifications it has on the industry as a whole. I believe what we’re going to see in the venture industry is a bifurcation of fundraising– basically a barbell on the graph of fund sizes. Large, well known, multi-sector and multi-stage “mega-funds” will be able to raise $750MM or greater at one end of the scale, and smaller, more focused funds will raise $250MM or less on the other end – with a relatively small number of funds in the middle. – NEA ($1.24Bn), Norwest ($1.2Bn) and Khosla Ventures ($800MM). At the bottom end of the scale there were numerous funds that raised money in the $25MM – $250MM range). And while there were certainly a few funds raised in the middle (notably Greylock, Matrix, DCM, CRV and Andressen Horowitz) my hypothesis is that fundraising in this size range will diminish over time as LPs move their money either to a smaller number of diversified, extremely large funds or the larger number of smaller, more focused funds (Foundry is clearly in the latter category). Previous PostJoin the search revolution! Introducing: Trada	Next PostHave you registered for Glue yet?